Goal: After collecting the DNA from the Mimulus plants last week in lab, this week we had the goal of running the DNA using gel electrophoresis to confirm genomic DNA and if present then amplifying the DNA using PCR. Methods: Before amplifying the DNA, we ran the samples on a gel to confirm presence of DNA. All samples were run and run fast to get a basic idea of the substance present. 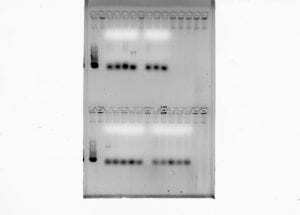 Once gels were finished and confirmed, we set up the PCR tubes with reagents needed. One of my table mates set up the master mix and we made sure all reagents were added in the correct order and kept on ice until used. The master mix was set up for 40 samples to ensure enough reagent was available to everyone at our table. Only 1 microliter of DNA was used and 19 microliters of master mix was used. This is because PCR works best with small amount of genomic information. The Taq was added last to the mastermix to avoid the start of the reaction before the DNA was added. Once all reagents and DNA was combined in the PCR tubes they were placed on the heat block for amplification. Results: All of my DNA samples were adequately collected and showed up on the gel. Everyone at my table had genomic DNA present. Data on proper amplification of genomic DNA was shown on Monday (10/29). 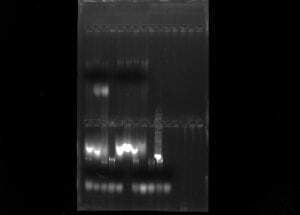 My samples as well as everyone at my table had genomic DNA post amplification showing that there was not a high amount of degradation.